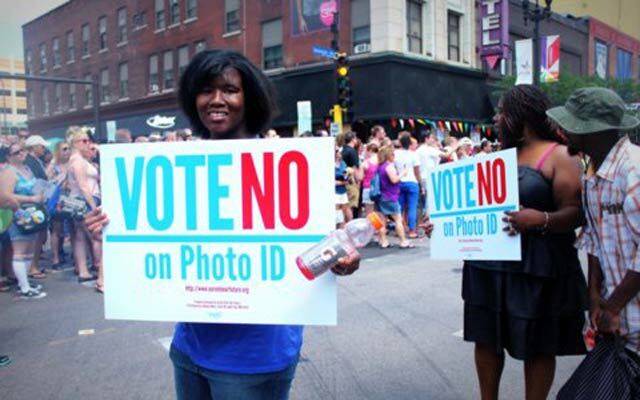 Minnesota’s voter ID is creating a new generation of activists fighting for social justice. Miracle Randle is one of them. The measure, which will be decided by voters in November if the state’s high court allows it, also requires “the state to provide free identification to eligible voters.” Yet those IDs wouldn’t exactly be free—at minimum, taxpayers would foot the bill, as would voters who would first need to obtain a $26 birth certificate and travel up to 100 miles to a Department of Vehicle Services office to apply for their ID. I learned about voter ID in February of this year. Before then, I didn’t understand what the bill was about, but I began researching it. I realized that if the amendment passes, everyone would need ID in order to vote—but there a lot of people in my community, in low-income communities, and homeless people who can’t afford ID. But everyone who’s eligible should be able to exercise their right to vote. I grew up in Chicago, where the community is a foundation for everything, so I’m taking a community approach here to bring African-Americans together around this. And I’m getting my friends to join me, by phone banking or going door to door. Our future generations will be affected depending on how this measure goes. You mentioned growing up in Chicago, which was a hotbed of civil rights activism fifty years ago. Do you see that generation’s work connecting to what you’re doing today? Definitely. I grew up with my grandma, she raised me and took care of me, I have aunties who were part of the civil rights movement. And I think this is why I became involved in the effort against voter suppression. My aunties and my uncles marched for the right to vote for all of us—for my right to vote. And I don’t think it’s fair that one strike could overturn everything that they fought so hard for. Some people are already set to vote against it and protect everyone’s right to vote—but some people still feel that everyone should simply have an ID. So my challenge becomes explaining how low-income people are limited in their ability to get the proper type of ID needed. I haven’t been especially successful yet, but I’m brand-new to organizing and campaigning. I started two months ago, and it can only get better. This is my first time doing organizing, and I love it. I graduate next year and now I realize that this is what I want to do from here forward—work towards social justice by preventing voter suppression.